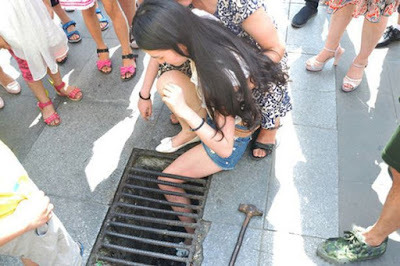 A teenager got stuck when she tripped while texting – and got her entire leg wedged in a storm drain.The girl, who has not been named, was focused on her mobile phone walking down the street in Mianyang City, in southwest China’s Sichuan Province. 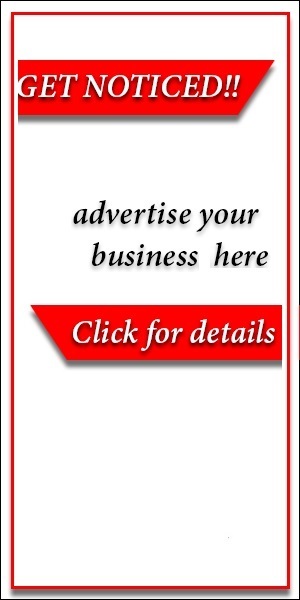 a friend, she took her eye off the pavement and when she stepped on a drain, her slim leg went straight through the bars – wedging her left foot tightly. Although passers-by stopped to help, she was completely stuck until someone called the fire brigade. They eventually freed her after a 45-minute wait. 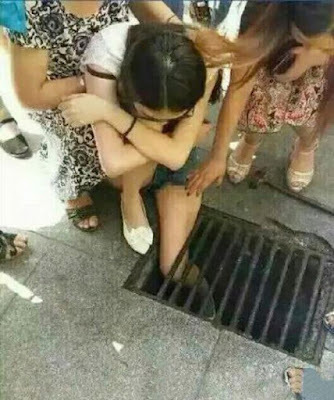 Eyewitness Jun Niu, who posted snaps of the ordeal, said: “She was more embarrassed than anything else, she covered her face up with her hands when people were gathered around and it was clear she didn’t want to be there.